Many Sufi brotherhoods build large tents at mawlids and offer large amounts of food to the needy as a service for God. The biggest services can offer several thousands of meals daily. 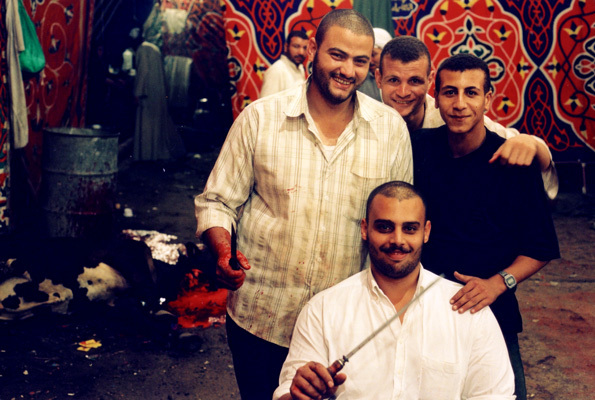 For many poor Egyptians who otherwise eat mainly vegetarian food, the mawlid is a rare occasion to eat plenty of meat. But eating at the mawlid is more than just filling the stomach: Slaughtering is a religious ritual in Islam and distributing the meat to the poor is an act of piety. And in Egyptian culture, hospitality is a major virtue and sharing food is a strong symbol of trust and friendship. For this reason guests at a Sufi tent are asked to eat "luqma", a small symbolic meal, even if they are not hungry.